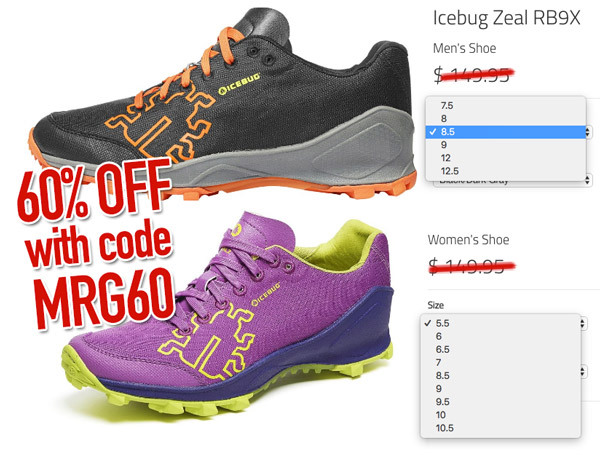 MRG's exclusive Icebug USA Outlet 60% OFF shoe blowout sale has been extended for a few more days, and we've added the Men's & Women's DTS3 RB9X GTX to the mix! Dial in your perfect fit with the BOA lacing system in this waterproof trainer. With our Distance Training Shoe (DTS), we aimed high in terms of comfort, soft padding in the collar and tongue, and a foot shaped ergonomic last that your feet will instantly love. The comfortable engineered mesh upper ensures your foot is protected, stable and comfortable all day long. The high torsion and fully cushioned midsole results in a stable shoe that also protects from over-pronating. The upper has a waterproof GORE-TEX membrane that turns this version of DTS3 into a three-season companion. The RB9X outsole provides superb traction even on wet surfaces, yet it matches the durability of an asphalt running shoe. Zeal, Acceleritas, Gaiters, & More! Snag a pair of men's or women's Zeal or DTS3, women's Acceleritas, or Icebug gaiters at 60% OFF while supplies last!